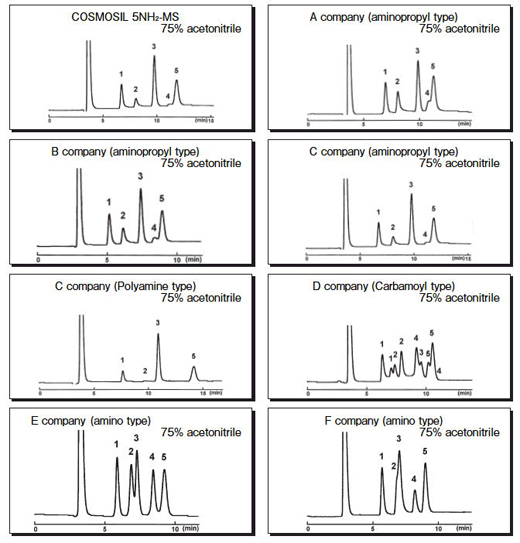 ﻿ COSMOSIL Sugar-D NH2-MS｜NACALAI TESQUE, INC.
Saccharides are not retained on standard C18 columns because of the low hydrophobicity of compounds. 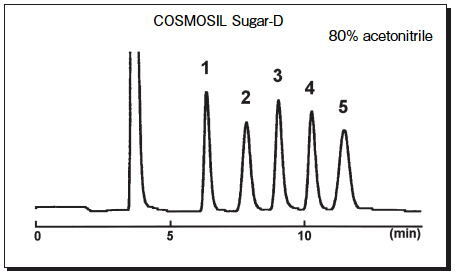 COSMOSIL Sugar-D and NH2-MS are specifically designed for separation of saccharides. COSMOSIL C18-PAQ is recommended for hydrophobic glycosides or saccharide derivatives. 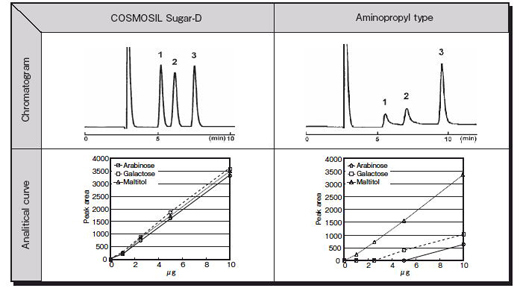 Conventionally aminopropyl bonded stationary phases are used for liquid chromatographic analysis of mono- and oligosaccharides. General shortcomings of the conventional aminopropyl bonded phases are tailing and adsorption of certain saccharides and the general low durability (short active life) of these columns. These problems are addressed and solved by the novel COSMOSIL Sugar-D, resulting in better (sharper) separation and much improved durability. Certain types of saccharides such as arabinose or galactose are partially or temporarily adsorbed on conventional aminopropyl stationary phases causing tailing or no elution at all. COSMOSIL Sugar-D provides superior separation and high recovery for these saccharides. The separation and the adsorption of monosaccharides were compared using COSMOSIL Sugar-D and other companies columns. Separation of aldoses, containing aldehyde group per molecule, is usually problematic with undesirable adsorption. COSMOSIL Sugar-D provides excellent separations for these saccharides. The conventional aminopropyl column is slightly more retentive than Sugar-D. The retention time of Sugar-D can be adjusted by increasing the concentration of acetonitrile in the mobile phase by 5%-10%.